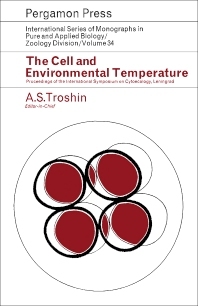 International Series of Monographs in Pure and Applied Biology: Zoology Division, Volume 34:The Cell and Environmental Temperature documents the proceedings of the International Symposium on Cytoecology held in Leningrad, U.S.S.R., from May 31 to June 5, 1965. This compilation focuses on the role of cellular reactions in the adaptation of multicellular organisms to environmental temperatures. The topics include the biochemical and physiological aspects of plant frost-resistance; mechanisms of resistance of poikilothermic animals to subfreezing temperatures; and changes in carbohydrate content of plants under heat-hardening. The analysis of seasonal changes in thermostability of frog muscles; effect of temperature on respiration and oxidative phosphorylation of pea seedlings; and metabolic and central nervous acclimation of fish to cold are also covered. This publication is intended for biologists concerned with the cytology, physiology, and ecology of plants and animals.